OLD PARKED CARS. 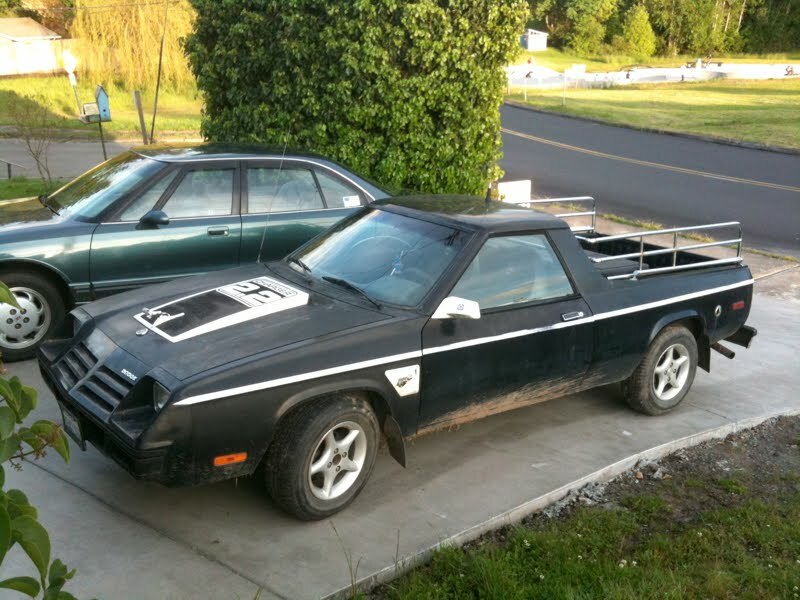 : 1983 Dodge Rampage. Someone really wants to make a manly vehicle out of this little guy. I can't believe those fender scoop/vents and hood scoop came from the factory! And that chrome scaffolding really sets off that rear profile. This thing is rated to get 47mpg on the highway. some period wheels would make a big difference, but the kittycat footprints aint helpin. 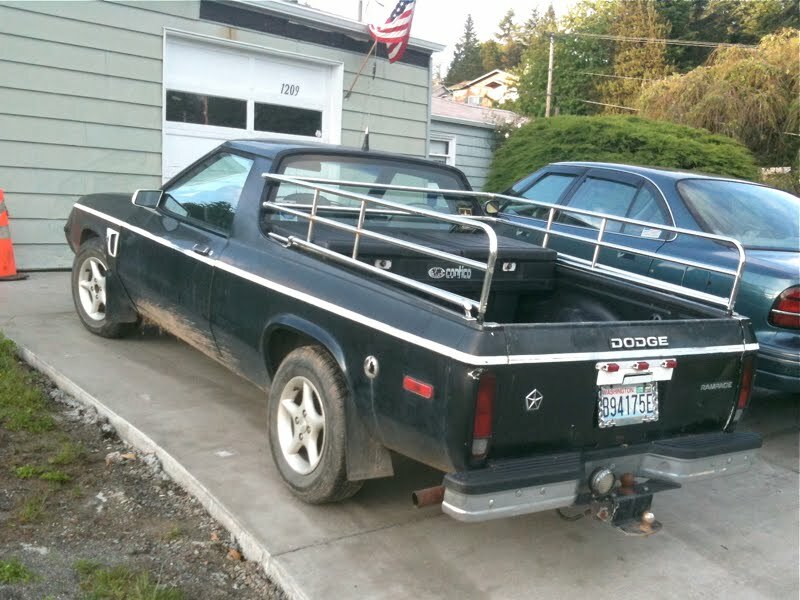 and OF COURSE it's got a DOUBLE trailer hitch. and get a chrome tip on that pipe, mister. That whole FWD Chrysler lineup was a joke, starting in 1978. Those engines have no balls. Also, what were they thinking about making a FWD version, of the El Camino? A truck? C'mon that thing is FWD... do seriously, think you can tow a boat or camper with that turd? My turd has 133,000 miles on it and is still going strong. It has towed cars that were twice it's size and survived. 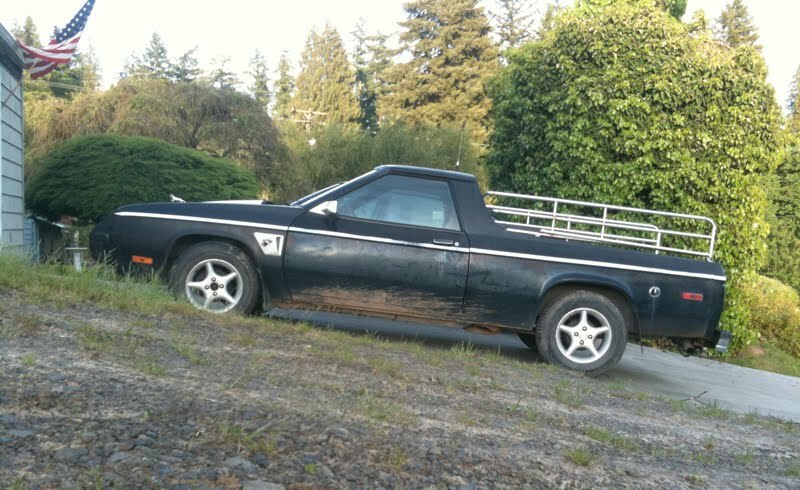 A tough little truck that never got the respect it deserved. what if i said that comment successfully increased my appreciation for this car? friends mom had one in high school, rural washington, 1984. I can personally attest that when driven by said friend, the rampage was fast as hell! Glad to hear that Brian, how'd you find this sweet post? Have you seen the rest of our Rampages? I can't believe how proud I am to say I've photographed them all. The Rampage wasn't a drag racer or tow mule.. Minitruck based on an economy car.. perfect for the occasional romp or home depot run. I like how that one fella has to compare it to a tow truck or a drag vehicle to demote it's status.. Weak..
Truck was fun to drive, I've had 3.. I would rather daily drive this than my GMC 2500HD.. 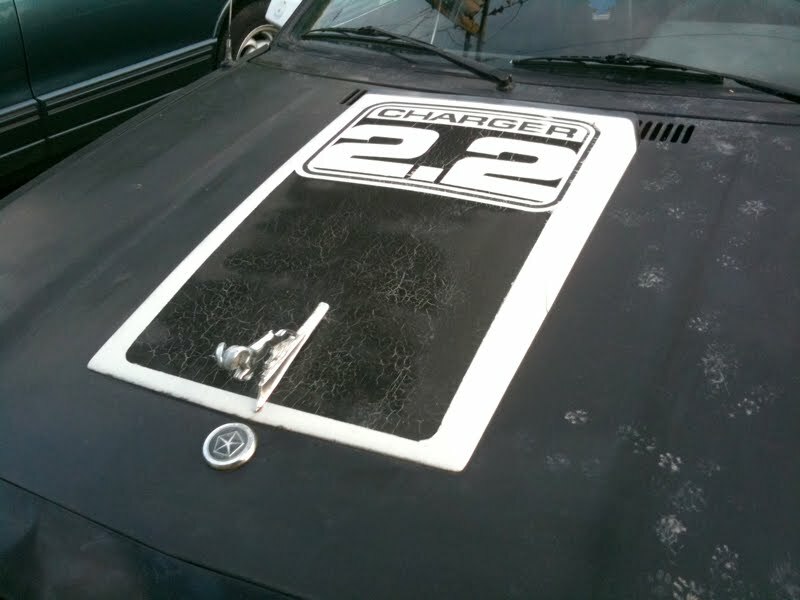 I can personaly say I have my first 1983 dodge rampage 2.2 model with the all american 97 horsepower detriot 2.2 dodge engine no mitzu or foregn in it and it goes verry nice for a 4 cyclender it has balls and if your don't think so its because it isn't a v8 I put this rampage to my old 1989 grand prix w body and it keeps up. 97000 original miles runs like a raped ape.